As with most 'histories,' this history on fringe begins with European/Americans and their adoption of this form of embellishment - though several Native groups have used various forms of fringe on their garments for hundreds of years. 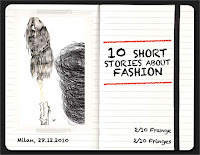 Nonetheless, this is an interesting overview of the use of fringe in fashion for the past 100 years, written and published on the Vogue Blog site. 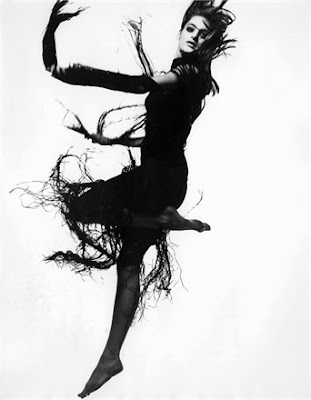 During the 1920s, one of the most popular dances, the Charleston, lent its name to a dress completely covered in fringe, that would move and shake along with the body's movement, revealing the legs. These embroidered or shawled dress invaded all of high society throughout America and Europe. These were the Fitzgerald years, and many of the period's actresses wore these kinds of dresses in either short or long versions. 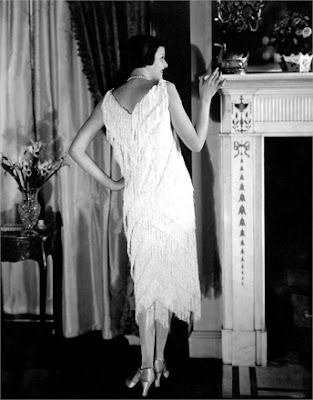 From Gertrude Lawrence and Olive Borden in 1925-27 to Joan Crawford in a white dress with fringes at the sleeves and around her whole body in 1932, to Claudette Colbert in a long cocktail dress in 1935. The designers of the era were Worth, who in 1927 made a dress entirely of fringes of silvery tinsel, and Vionnet who created dresses with large floral designs and long fringe in 1924. In the '50s, Elvis Presley adopted fringe as his uniform with his famous leather jackets, creating an army of worldwide followers. In that same period (late '40s and early '50s) the Hell's Angels movement adopted the fringed look with jackets and gloves while riding their Harley Davidsons. In 1952, Rita Hayworth, captured attention with a fringed dress entirely embroidered in sequins, and two years earlier the costume designer Gilbert Adrian had created a dress made exclusively from fringe for another star. This was the trend for elegant and sensual divas. 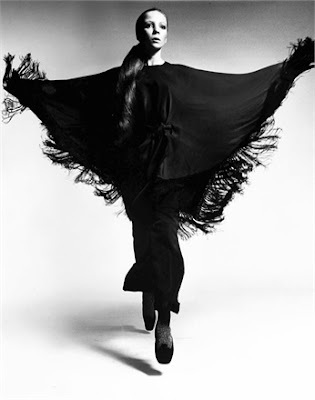 The last designer to treat fringe with diva-esque allure was Valentino in the '60s, with a red poncho featuring long fringe worn over trousers. Already in '60s, however, fringe began to take on Native American influence. Yves Saint Laurent was inspired by Africa and in 1967 created two African dresses with straw fringe on mesh dresses with embroidery in wood and beads, and then revisited the fringe theme in the same year for a mink coat. Twiggy, Jane Shrimpton, Penelope Tree, Sonny Bono and Cher, all frequently wore jackets and dresses in suede with fringe with an American Indian feel. 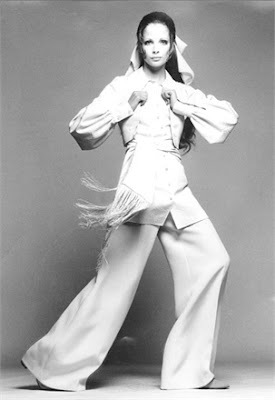 It became Cher's style, who for a period wore fringe for both day and evening wear. 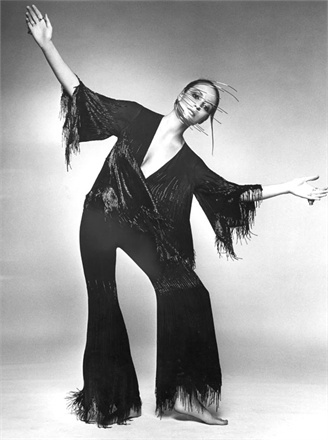 In the '70s, fringe increasingly appeared in fashion magazines and were photographed by the likes of Lichfield, Bert Stern, David Bailey and Richard Avedon, as well as Helmut Newton, Irving Penn, and Barry Lattegan. Then when the Hippy movement took off in the 1970s, suede and fringe were everywhere, especially in places like Biba on Carnaby Street, and became more and more decorated. 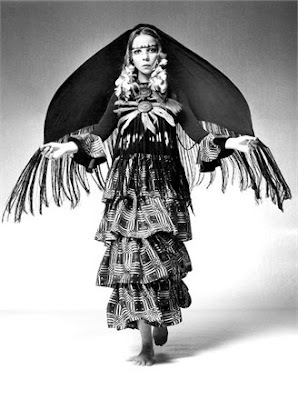 Bill Gibb invented gypsy dresses and patchwork with fringe, while Martine Gruber created the first fringed and hooded ponchos. Twiggy herself had Bill Gibb create embroidered suede trousers and jackets with fringe for her debut at the Royal Festival Hall Concert in 1976. Still in the '70s, Jacques Cassia made his name with a two-piece outfit with a fringed vinyl skirt and a knotted aluminum brassiere. The trend contaminated into the music scene, with figures like Ringo Starr with his wife Maureen Cox and Tina Turner at a concert at New York City's Felt Forum, dressed in a mini-dress by lori Lazaar. 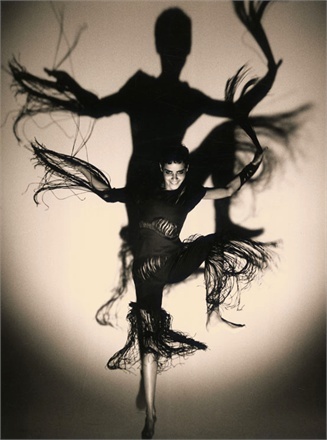 In 1980 Stephen Sprouse launched knitwear with fringe, Giorgio di Sant'Angelo created wide, colorful chiffon dresses with fabric strips forming fringe, and Claude Montana worked a lot with leather embroidered with studs and fringe. In the same period, Ralph Lauren became known for skirts, trousers, jackets, long coats and suede dresses - all with fringe. Christian Lacroix made an sculpture-dress, creating the jackets with embroidery and fringe like drapery cords and trousers made exclusively of corded fringe. Giorgio Armani, at the end of the '80s, sent models down the runways with embroidered, patterned, long-fringed shawls, as well as fringed evening dresses. In 1990, Dolce & Gabbana created a long skirt and top embroidered with crystals forming short fringe. It was worn by Linda Evangelista and photographed by Steven Meisel. From the mid-90s, Jean Paul Gaultier created entire collections with a fringe theme, both for dresses and leather coats. 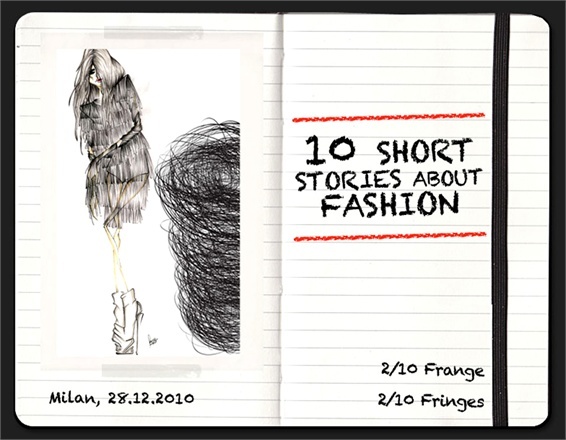 In the same period, John Galliano dedicated an entire collection to Squaws and then to China, always with the use of fringe - although with different origins. In the Spring of 2007, fringe became ubiquitous, this time with a cowgirl connotation. Prada proposed a short tunic made entirely of fringe, along with coats, clutches and bags. It became the trend of the season: in that same year, Roberto Cavalli sent down the runway a dress made with glass bead fringe. And after only three years, he then re-proposed an entirely fringed collection. Impossible to extinguish, fringe will always come back. In one way or another. oh, wow! I'm really gonna need this for my next article!